At around sixty pages and full of bullet points and pictures, this is a short and simple little book to help drivers to think through how they use their cars. It may actually have been given away free originally, considering it has ‘Perth and Kinross Council, with compliments’ on the back of my copy. 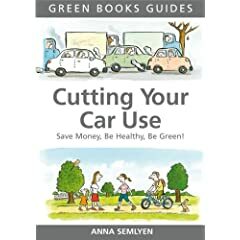 Anna starts with why you might want to cut your car use in the first place, and at the top of the list is cost. There’s a handy chart for working out how much your car costs you. Her conclusion is that if you do less than 8,000 miles in a year, you’d probably be better off without a car. If that’s not enough, there are health and time reasons, and then the environment, with air pollution and climate change to contend with. 22% of the UK’s carbon emissions are from road transport. One of the most compelling reasons for not wanting to drive is missing though – oil. Since so much oil is in the hands of corrupt governments and oppressive regimes, I’d rather use as little oil as possible. The book skips this concern in favour of more friendly ‘be healthy, be green’ reasons. I expect most people who read the book have already decided they’d like to cut down on their driving, so it’s the later sections that are most useful. To work out where you can make cuts, you have to work out how you use your car. Is it mainly work, the school run, shopping? 24% of car journeys are shopping trips. Once you know the areas that need your attention, you can turn to solutions. These might include flexible working or working from home, or car-sharing, or buying your groceries online. There are a lot of obvious points here, but some surprising things too. For example, for the price of owning a car, you could spend £8 a day on taxis or get a hire car for 55 days. 61% of trips of 1-2 miles are done by car. We prepared to walk one mile, but not two apparently. Can you get by without a car? Plenty of people do. I lived for ten years in the UK without a car until I got married last year. I know of a family of six who only have a tiny electric car, since they almost never need to drive somewhere all together. If they do, they hire a car. ‘Cutting your car use’ may be short, but it’ll get you thinking. I don’t even drive (though I am learning), and it’s rarely a problem for me. My parents had a car some, but not all, of the time I was growing up. On one of the snowy days last week, a colleague of mine who usually drives to work walked in. I was rather suprised, as I’d just got the idea that people who own cars promptly lose the ability to walk – but perhaps that impression is partly created by my job, where I’m more likely to encounter those who can’t be bothered to walk than those that can. Next Entry Questions in the snow – is our lifestyle nature-proof?